← Jeanne M. Rosendale, Esq. 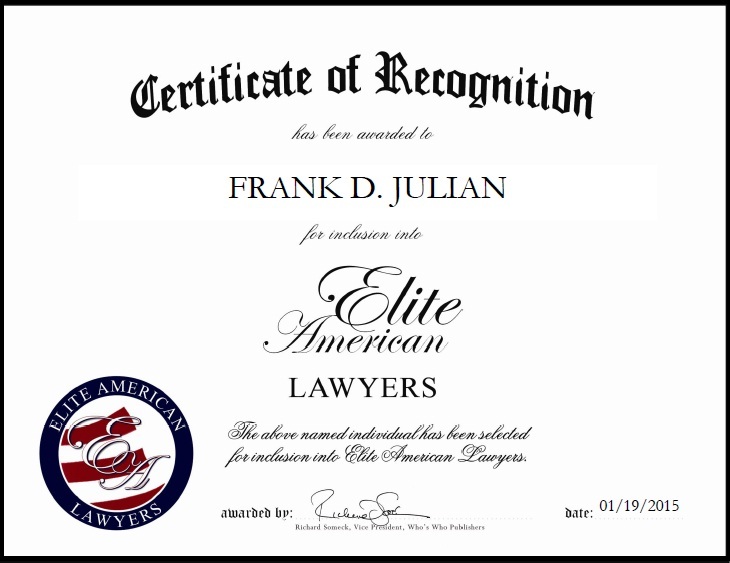 SOUTH BEND, IN, February 27, 2015, Frank D. Julian, Owner and Attorney with Sweeney Julian P.C., has been recognized by Elite American Lawyers for dedication, achievements, and leadership in personal injury law. Fresh out of law school, Frank D. Julian went to work both on his own and with other personal injury lawyers. In 2000, he was approached by Charles Sweeney with an idea of opening a new branch of his personal injury law firm in South Bend. Sweeney had practiced in South Bend for 30-plus years, but at the time only had an office in Fort Wayne. The South Bend office of Sweeney Law Firm opened in 2001 with both men working together. Mr. Julian is known throughout Indiana as a champion of the people and an advocate for individuals who have been injured as a result of the negligence of another. He is also known far and wide for his philanthropy on behalf of injured soldiers, those suffering from leukemia and other blood diseases, the Potawatomi Zoo, National Public Radio, Girls on the Run, and many other local charities. Mr. Julian’s background covers the spectrum of personal injury litigation. He has extensive experience litigating cases involving motor vehicle collisions, tractor trailer/truck collisions, and motorcycle collisions. The story of how he came to be a trial lawyer is an interesting one. 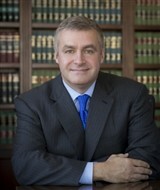 He has known for a long time that he wanted to earn his living in the courtroom as a trial attorney. However, he did not take the normal path from school toward the leadership of a major law firm. Before law school, he followed another calling by serving his country in the U.S. Navy. He comes from a Navy family. His father, Frank Sr., was a naval officer who served for 35 years commanding several ships and retiring as a captain. In fact, Mr. Julian was born while his father was serving in Vietnam as the commanding officer of the USS Asheville. While growing up, his family lived all over the country, wherever his father’s duty assignments took them. His mother is a nurse with a specialty in geriatric care and the director of nursing at several nursing homes. This entry was posted in Personal Injury and tagged AV Preeminent Attorney. Bookmark the permalink.